This is a touching and imaginative tale about two little French girls who discover an English soldier in the woods near their home during World War I. Shell-shocked and blind, the soldier is determined to make his way home to care for a sick brother, and the girls do their best to help him. In return, he tells them tales both true and imagined, spun from the little silver donkey he carries in his pocket. Performer Richard Aspel's narration strikes just the right notes of both sadness and whimsy, while his voices for the little French girls are amusing. An award-winning young adult tale that speaks to both the horrors of war and the powers of friendship. One bright spring morning in the woods of France, a soldier, blinded by the war, is found by a little girl named Coco, and her older sister Marcelle. 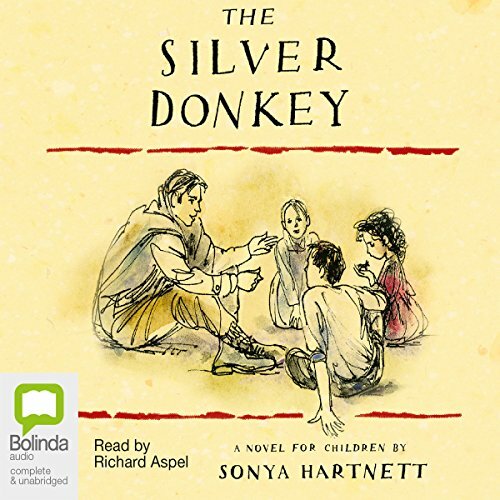 In return for their kindness, the soldier tells the sisters marvelous tales, each story connected to the keepsake he carries in his pocket: a perfect, tiny, silver donkey. As the days pass and they struggle in secret to help the soldier reach home, Coco and Marcelle learn the truth behind the silver donkey, and what the precious object means: honesty, loyalty, and courage.